Feel the joy and poignancy of GHDT’s SIMCHA. 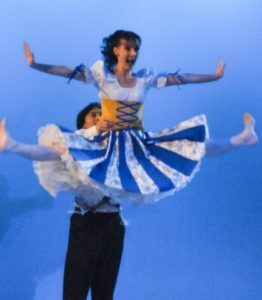 This popular repertoire piece of Gregory Hancock Dance Theatre will be performed in a cabaret-style dance concert this February 3-18, at The Academy of GHDT. Performances are Saturdays at 7pm & Sundays at 3pm. SIMCHA is an appropriate title as it is derived from the Hebrew word meaning gladness or joy. This production will offer a variety of Yiddish and Klezmer music with vignettes showcasing dance and costume from Jewish culture and heritage. Light refreshments will be served to round out the enchanting and festive evening.